North Star Marketing - No More Cold Calls! There’s nothing like a mandate from the CEO to make cold calls that will kill sales enthusiasm and make even the best sales professional depressed. Cold calls are usually detrimental to a sales professional’s health, and a waste of company resources. What works much better are calls to qualified buyers who are ready to buy. Sounds logical, doesn’t it? The problem is that most companies don’t use their resources to find and qualify leads for their salespeople. We call that process “marketing.” It’s the process of generating qualified leads for your sales team to make a “warm” call and then further process the lead. When your sales force is making “warm” calls you’ll have better results: less waste and more profits. There are numerous ways to keep the pipeline filled, and here’s where you can be as creative as you want. In addition to creativity, though, you’ll want your message to be consistent and frequent. Sending your message to your prospect one or two times isn’t going to fill the pipeline. You’ll need to have a frequency level that gets you on his radar screen and then on his buying list. Research shows that it takes 8 to 10 times just to get on your buyer’s radar screen. So keep those messages going if you want to keep your sales pipeline filled. North Star Marketing is a unique marketing and branding firm with 17 years of marketing, branding and public relations services. 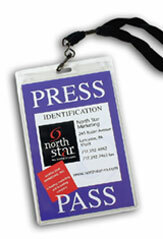 Call (717) 392-6982 for an information packet on our PR program “Newsmakers”, or visit www.northstar-m.com. For more information, go to www.northstar-m.com or e-mail Kae Groshong at kgwagner@northstar-m.com or call (717) 392-6982.